On The X-Files Season 11 Episode 10, the Cigarette Smoking Man pushes forward with his plan while Mulder and Scully rush to find William no the season finale. On The X-Files Season 11 Episode 9, Mulder and Scully uncover a mysterious cult consumed with macabre rituals while investigating the theft of human organs. 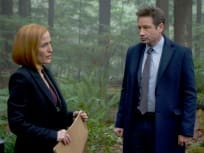 On The X-Files Season 11 Episode 8, Mulder and Scully suspect that darker forces are at play when they investigate a brutal animal attack on a little boy. 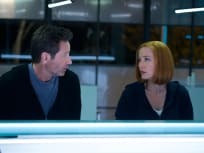 On The X-Files Season 11 Episode 7, Mulder and Scully find themselves targets in a deadly game of cat-and-mouse in a world of increasing artificial intelligence. 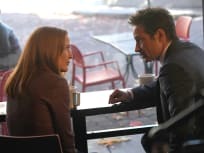 On The X-Files Season 11 Episode 6, Mulder and Scully attempt to track down Skinner when he disappears after his past comes back to haunt him. On The X-Files Season 11 Episode 5, Mulder and Scully investigate when two teenage girls attack one another, each believing that the other is a monster. On The X-Files Season 11 Episode 4, Mulder and Scully learn how the X-Files themselves may have originated when they explore the idea of the Mandela Effect. On The X-Files Season 11 Episode 3, Mulder and Scully find a pair of twins playing a dangerous game with doppelgangers that have lead to a series of murders. On The X-Files Season 11 Episode 2, an old friend reaches out to contact Mulder and Scully in a seemingly impossible way and reveals a chilling secret. 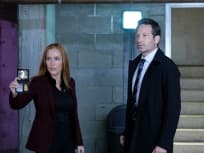 On The X-Files Season 11 Episode 1, Mulder and Scully learn that they aren't the only ones desperately searching for their long-lost son on the season premiere.